Quantum dots (QDs) made of lead chalcogenide semiconductors have been investigated for various photonic applications because they can absorb photons and photoluminesce at wavelengths from near-infrared to visible. For practical applications, QDs should be incorporated into solid matrices and glasses can be used as such matrices because they are chemically and mechanically stable. They can also prevent QDs from agglomerating. In particular, lead chalcogenide QDs have been synthesized in phosphate, borosilicate and silicate glasses. 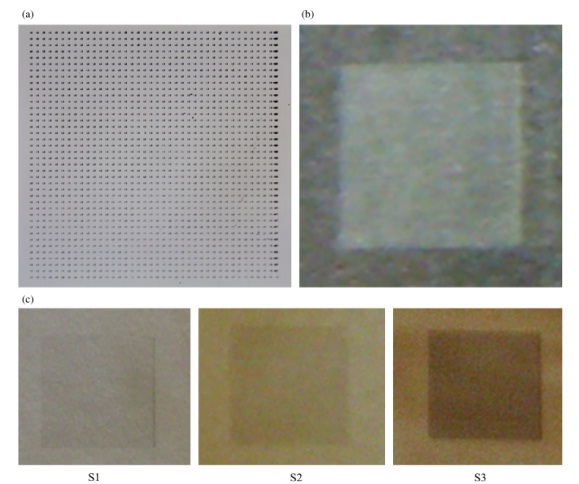 Tunable absorption and photoluminescence (PL), reversible brightening and darkening, two beam modulation of the PL and optical gain have been achieved in glasses containing lead chalcogenide QDs. Glasses containing semiconductor QDs can also be used as saturable absorbers for generation of laser pulses. To realize the desired optical characteristics, the size and spatial distribution of QDs in glasses must be controlled. Previously the growth of QDs in glasses was controlled by optimizing temperatures and durations of thermal treatment, but it is tedious and often difficult to control the growth of nano-sized crystals by the thermal treatment method only. For example, a slight increase in the thermal treatment temperature often leads to the uncontrolled growth of large quantum dots with a broad size distribution. On the other hand, precipitation of quantum dots with a narrow size distribution frequently requires an unpractically long heat-treatment. Ion-implantation and femtosecond laser irradiation have been attempted to alleviate these difficulties with a limited success. Ion-implantation led to the precipitation of the quantum dots within the several hundred nanometers depth from the surface of the glasses. Irradiation of the femtosecond laser can potentially induce the precipitation of quantum dots inside the glasses. On the other hand, nucleation of fluoride crystals in glasses was reported using rare-earth ions as nucleating agents. However, it has been difficult to control the size of the fluoride crystals to less than 10nm in diameter. 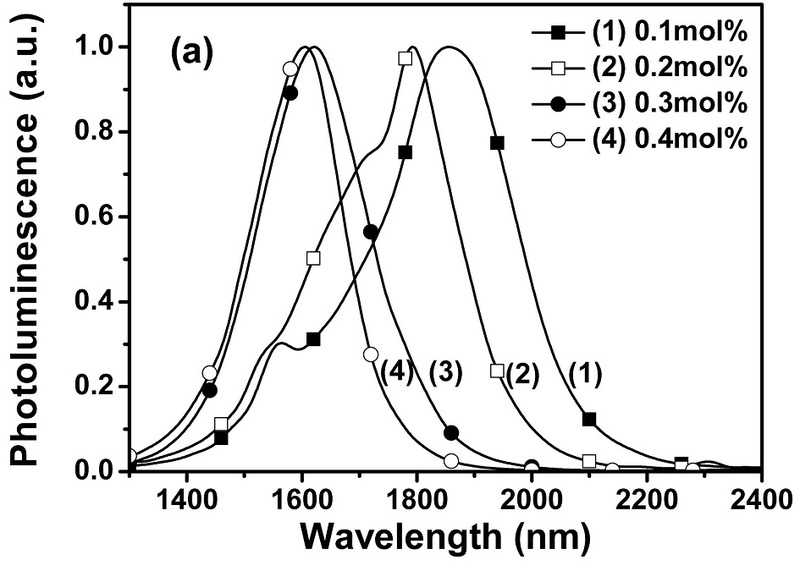 <Normalized absorption spectra of glasses with different Er2O3 concentrations heat-treated at 490℃ for 20 hours. 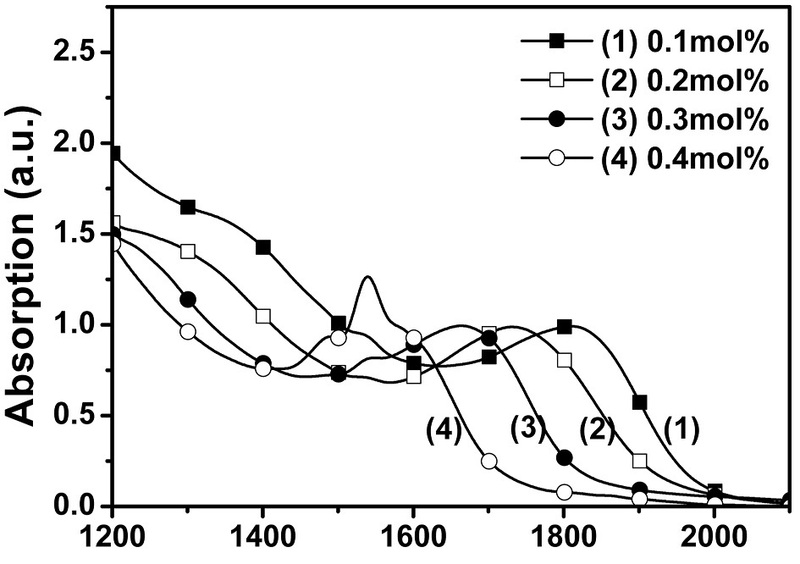 <Normalized PL spectra of PbS QDs formed in glasses with different Er2O3 concentrations heat-treated at 490℃ for 20 hours. The silver ion was introduced in the glasses with ion-exchange method. In order to form silver nanoparticles, specimen was thermally treated. irradiation. (c) Photographs showing color changes of the specimens upon thermal treatment of S1 (430 1 C/30 h), S2 (430 1 C/10 h), and S3 (420 1 C/20 h). The dimension of all the square features in the graphs is 2 mm*2 mm. Photoluminescence (PL) spectra recorded from the irradiated squares and nonirradiated areas after heat treatment. Irradiation energies were (a) 95 uJ, (b) 148 uJ, and (c) 247 uJ. The solid line in (a) was recorded from the irradiated square before heat treatment. The solid and open circles represent the PL spectra recorded after heat-treatment from the inside and outside of the irradiated squares, respectively.